The timing of the Treasury’s criticism of German economic policy seems to be particularly well timed. Today Eurostat released data showing that European unemployment remains stuck at an appallingly high rate of 12.2%. It also reported that over the past year overall European consumer price inflation had decelerated sharply from 2.6% to 0.7%. With a number of countries in the European periphery already on the cusp of outright deflation, these trends have to raise questions as to whether overall Europe might not be heading for a bout of Japanese-style deflation. Sadly, while the Treasury’s admonishment is likely to rile the German policymaking establishment, it is unlikely to change German policies. Seemingly coming from a different planet, German policymakers believe as an article of faith that since budget prudence and structural reform has served Germany well over the past decade there is little reason for Germany to change course now. They simply dismiss as a misguided Anglo-Saxon idea any notion that draconian belt tightening in the European periphery needs to be offset by budget expansion in those European countries that have room to do so. 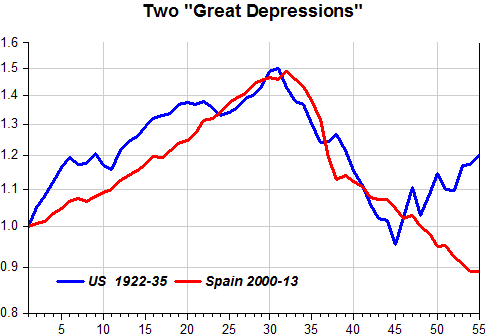 As I showed previously, Spain is doing even worse than the US during the Great Depression (and its unemployment rate is even higher). Note: Commenter Hypmod (and Miguel via e-mail) alerted me that the data I used in the charts was incorrect. I thank them for pointing the error. 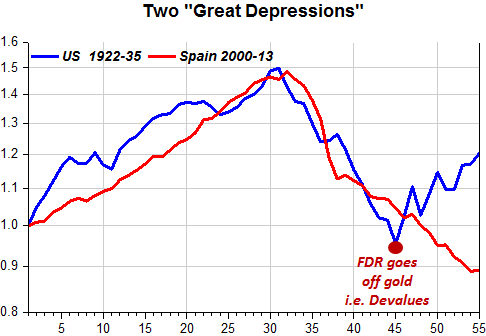 My mistake was to inadavertendly graph the data for Real Gross Investment instead of RGDP for Spain. (I should have guessed it was”to tragic to be true”). The correct charts follow below. I am very sorry for any inconvenience caused. Update: A starling startling comparison! 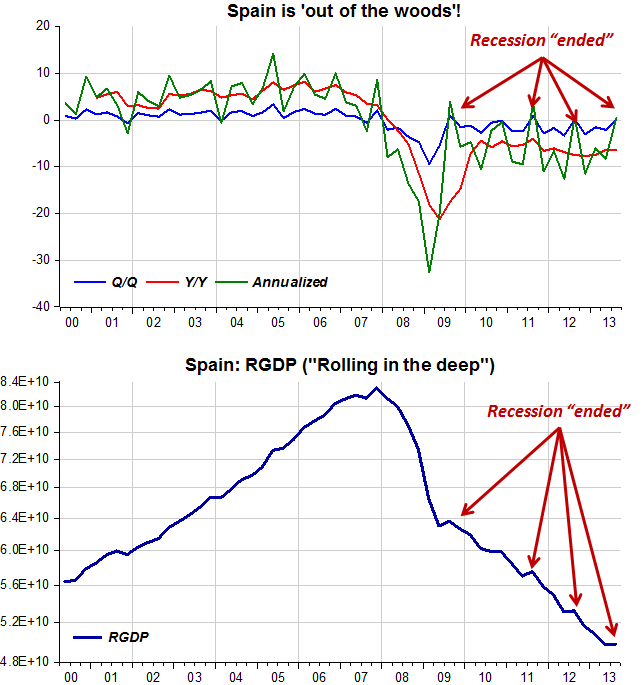 To say the recession “ended” is also wrong. 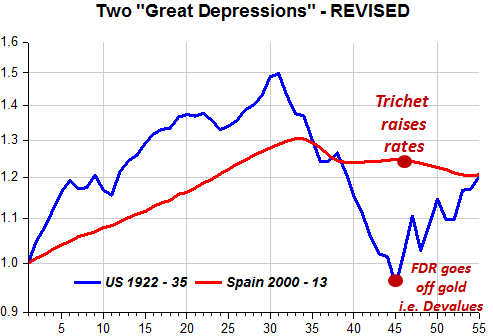 Spain is still very much “depressed”! If Europe is the ‘avant guarde’, we´re doomed! A deeper, more worrying explanation is that Europe does not have a strong desire for growth. In fact, some have become convinced that, given the environmental consequences, economic growth does more harm than good and that the crisis should be regarded as an opportunity to shift to a more frugal economy. The growth agenda, according to this view, is a Trojan horse for ecological neglect – for example, through more business-friendly environmental regulation or shale-gas exploration. Without much ado, this is very much to the point. The Fed needs to stop playing taper ping pong. In June, the Fed’s statement after its meeting scared markets by suggesting that tapering/tightening might begin as soon as September. In September, the Fed acknowledged that the June tapering scare had tightened financial conditions and so hinted that they might not taper until winter 2014. At its October 30 meeting, the Fed removed from its statement an expression of concern about tighter financial conditions while leaving the rest of its statement largely unchanged from September. Markets concluded that tapering would begin sooner than they had guessed after the September meeting [Jon Hilsenrath said “December taper not off the table”]. Stocks and bonds sold off while the dollar strengthened. In reality the Fed’s position was virtually unchanged. Tapering won’t begin until the economy improves. Nothing was said about what the Fed will do if the economy gets worse. Taper ping pong is increasing the chance that the economy will stagnate, as underlying monetary and fiscal drag pulls the growth rate below a 1% pace. After its December meeting, the Fed might want to hint at what it will do if the economy is weaker than expected instead of only talking about how it will taper sooner if the economy gets stronger. Kudlow: You’ve got a school of thought, Alan, they call themselves market monetarists, who believe the mistake the Fed has made is that they should be targeting nominal GDP and that would give us the [economic] uplift. What do you think of that? MR. JORDAN. This question of when the time is going to come to change the [funds] rate–especially in an upward direction–and the criteria for doing so has been on my mind a lot, and I’m sure it has been in everybody’s thinking. 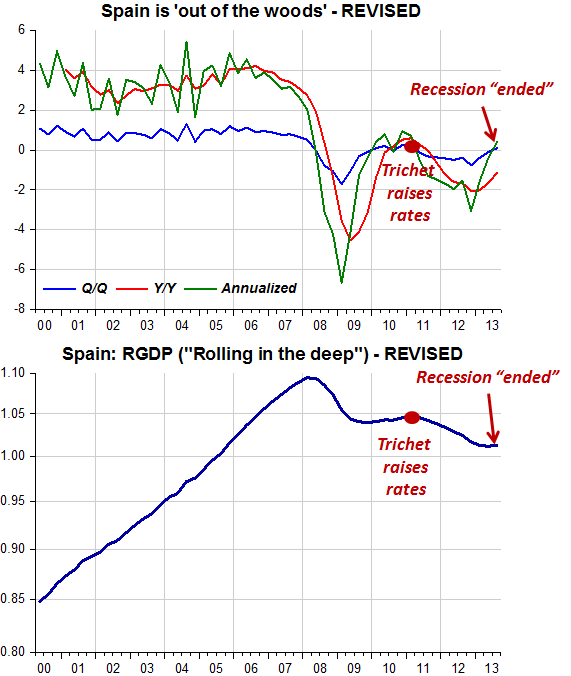 This is my seventh meeting, and I thought it was time to go back and review the last year and to look at what actually has happened in terms of all kinds of economic indicators–monetary as well as economic indicators, nominal and real indicators–and Committee actions to see if I could deduce an implicit model. I read the newsletters, as I’m sure everybody does; and [unintelligible] and I don’t see it in the numbers, it’s certainly not inflation. It’s not the various money measures: Ml, M2, the base, or bank reserves. I don’t even think its real GDP. I put together a table–a big matrix of every forecast for as many quarters out as the Greenbook does it–for every meeting for the last year. What struck me was that it looked as if we were on a de facto nominal GNP target. When nominal GNP is at or above expectations, the funds rate is held stable; but when nominal GNP comes in below what has been expected, we cut the funds rate. Do you want to comment? MR. PRELL. I’d like to establish that in the past the Federal Reserve has shied away from enunciating a view about potential GDP growth, remaining agnostic and being prepared presumably to accommodate any positive surprise. If the positive surprise on nominal GDP could be discerned to be a favorable supply shock, then accommodating it would be a more natural thing to do than if you felt it was a demand shock which tightened up markets and had inflationary consequences down the road. But viewing nominal GDP targeting as your basic approach takes some things as given, as being relatively stable. You may view this [approach] as a way of having an automatic stabilizer over time so that it would be natural to react if you’re overshooting, with the thought that you would end up with some price pressures later [if you don’t react]. MR. PARRY. Jerry, in the discussion about nominal income targeting it’s clear to me that there are some problems associated with it. But what is perhaps more relevant is whether the problems associated with nominal income targeting are greater or lesser than those associated with interest rate targeting. I’m afraid a lot of the academic literature would suggest that we probably would reduce the chance of making the kinds of mistakes that we make with interest rate targeting if we followed a nominal income target. MR. ANGELL. Well, nominal GDP targeting is really not as bad as it might seem in that it does have a heavy price level direction to it. That is, the advantage of using nominal GDP as a target versus using real GDP is that we are saying to other policymakers that if they in some sense gear up activities that tend to cause wage rate pressures or other price pressures to take place, then they are voting for lower real GDP. So, nominal GDP targeting is not that far away from what I think is price level targeting. I think price level targeting is better, but we’ll see. MR. KOHN. But in the case of a supply shock, a lot of people have advocated nominal GDP targeting. We discussed this actually in August of 1990 in the face of supply shocks. It is supportive, as Governor Angell said, because it has some of these automatic stabilizer-type properties that Mike was talking about; you can’t overshoot too badly on one side or another and you bring about corrective actions, particularly when you’re unsure with prices going one way and quantities going the other way. And this is how things worked out for the rest of Greenspan´s ‘reign’. Sure, all was not perfect. The Fed made some mistakes, causing instability, but the important thing to note is that they were corrected (funny how many at present say that correction was an important cause of the crisis!). If John Taylor can repeat himself, why can´t I? It is a common view that the shutdown, the debt-limit debacle and the repeated failure to enact entitlement and pro-growth tax reform reflect increased political polarization. I believe this gets the causality backward. Today’s governance failures are closely connected to economic policy changes, particularly those growing out of the 2008 financial crisis. The crisis did not reflect some inherent defect of the market system that needed to be corrected, as many Americans have been led to believe. Rather it grew out of faulty government policies. In the years leading up to the panic, mainly 2003-05, the Federal Reserve held interest rates excessively low compared with the monetary policy strategy of the 1980s and ’90s—a monetary strategy that had kept recessions mild. The Fed’s interest-rate policies exacerbated the housing boom and thus the ensuing bust. More generally, extremely low interest rates led individual and institutional investors to search for yield and to engage in excessive risk taking, as Geert Bekaert of Columbia University and his colleagues showed in a study published by the European Central Bank in July. Meanwhile, regulators who were supposed to supervise large financial institutions, including Fannie Mae and Freddie Mac, allowed large deviations from existing safety and soundness rules. In particular, regulators permitted high leverage ratios and investments in risky, mortgage-backed securities that also fed the housing boom. I fully agree with the “regulators at fault” argument, but not at all with “the Fed´s interest rate policy exacerbated the housing boom and ensuing bust” argument. 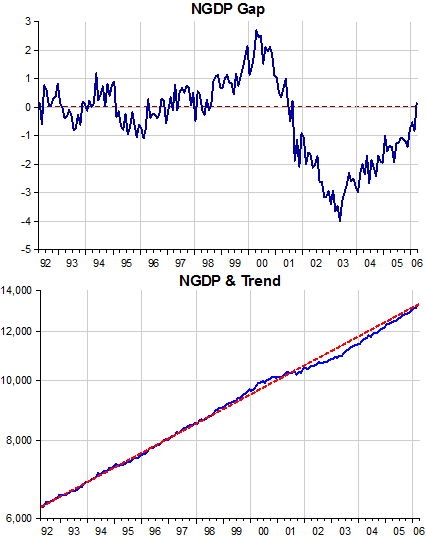 The charts show a version of the “Taylor Rule”, the NGDP gap (the distance of NGDP from trend) and the path of NGDP and its trend. Taylor subscribes to the conventional view that monetary policy equals interest rate policy. 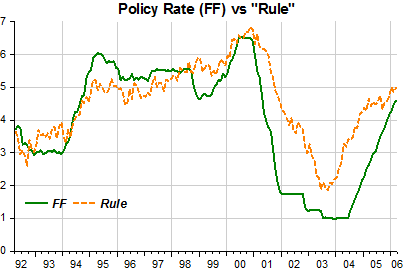 Therefore, if the FF rate is below the rate indicated by the “rule”, monetary policy is deemed “easy” (loose, lax), and vice-versa if the policy rate is above the “rule” rate. 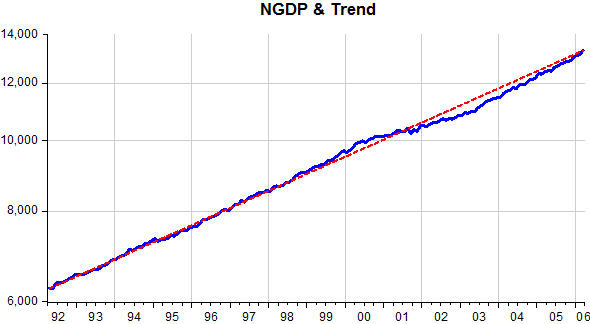 But if you interpret “easy” monetary policy as NGDP growing above trend (positive gap) and “tight” monetary policy as NGDP growing below trend (negative gap) you would say that monetary policy was “too tight” in 2001-03 when the gap turned significantly negative (despite the policy rate being less than the rule rate)and that monetary policy was “correct” in 2003-05 when NGDP was converging to the trend level (closing the gap), despite the rising policy rate during part of this period. When Bernanke took the Fed´s helm the gap had been closed. What happened going forward, in particular the complete loss of nominal stability in 2008, which made the financial crisis immensely more severe, is the doing of the Bernanke Fed. And this was motivated by a fixation on inflation, disregarding the NGDP level targeting rule that the Fed should not react to a supply (oil price) shock! My Sunday article about the benefits of moderate inflation drew a lot of skeptical responses, many about the premise that rising prices would lead to rising wages. This is an old and well-established concern. “People dislike inflation because they assume that wages will not keep pace,” Robert Shiller wrote in a 1996 paper describing the results of a multinational survey. In some cases, it is clear that incomes will not rise in the short term. 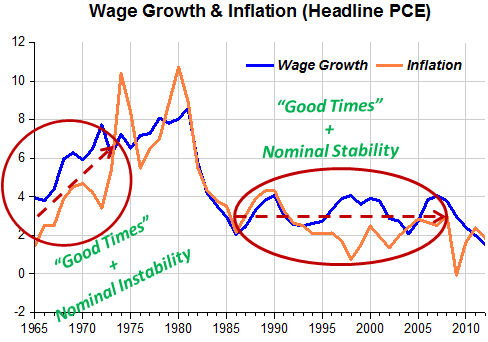 Historically, “rising prices go together with rising wages” barring moments (73/74, 79/80) of supply shocks (oil prices) that have the effect of raising the cost of living and reducing the standard of living. So let´s be ‘happy’ again by providing nominal stability through targeting NGDP along a level path! So it seems that the path of NGDP is an important factor behind long-term unemployment (and the resulting number of unemployable workers). In 1973 Arthur Burns did not believe inflation was the result of expansionary monetary policy, so he geared MP to employment. In 2008, Bernanke was very much afraid of inflation taking-off. Acting on this perception the Fed tightened monetary policy to a degree not seen since 1938. To avoid future human tragedies the Fed should concentrate efforts in stabilizing NGDP along a reasonable trend level path. If it does so it will limit the future length of unemployment and the number of ‘unemployable’ while maintaining overall macroeconomic stability. One of the distinguishing features of the Great Recession and its aftermath has been the spike in the number of individuals experiencing long-duration unemployment spells, defined as lasting more than 26 weeks. This paper analyzes the effect of unemployment duration on individual’s future earnings and other outcomes, such as homeownership and wealth, using data from the Panel Study of Income Dynamics (PSID). The results show a negative relationship between a worker’s most recent unemployment spell and his or her current earnings. The earnings of displaced workers do not catch up to those of their nondisplaced counterparts for nearly 20 years. The effect of unemployment on earnings is even more substantial for workers unemployed 26 weeks or more. Unemployment spells also negatively impact future homeownership—this finding suggests that the consequences of the recent spike in unemployment duration could affect more than individuals’ expected lifetime earnings. 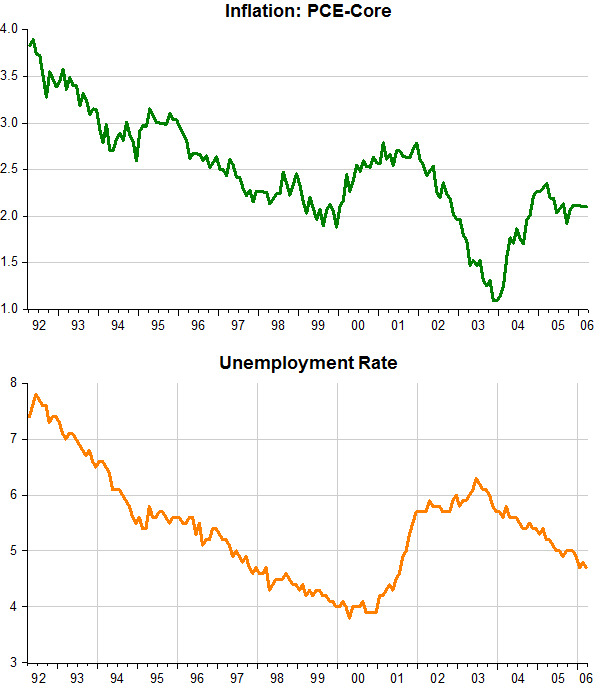 Given the costs of long-term unemployment, policies aimed at reducing the unemployment rate—such as the Federal Reserve’s quantitative easing program—could have the added benefit of limiting the negative consequences of long-duration unemployment through fostering faster re-employment. Policy “incrementalism” is not getting the job done. As Christy Romer indicates, a regime shift is needed. After every crisis, there’s a search for culprits. Greenspan was a tempting target because his reputation was so outsized. Understandably, his legacy is now said to be tarnished. But neither critics nor defenders acknowledge the real source of failure: He was too successful. Greenspan presided over nearly two decades of prosperity with only two historically short and mild recessions, in 1990-91 and 2001. Serious threats to the economy (the 1987 stock market crash, the 1997-98 Asian financial crisis, the dot-com bubble, Sept. 11, 2001 ) were defused. The lavish praise reflected the belief that Greenspan’s deft changes in interest rates and crisis interventions stabilized the economy without rekindling inflation. But there was an unrecognized downside: With a less-risky economy, people — homeowners, bankers, investment managers — concluded they could do things once considered more risky. Consumers could borrow more because economic stability enhanced their ability to repay. “Subprime” home mortgages granted to weaker borrowers became safer because housing prices would constantly rise. Banks and investment banks could assume more debt because financial markets were calmer. Hence, the Greenspan Paradox: The belief in less risk created more risk. It was the Great Moderation that gave us the financial crisis and Great Recession. That’s the central lesson here, and it’s both disturbing and largely unexamined. Almost everyone wants prosperity. The holy grail of “macroeconomics” (the study of the overall economy) is to minimize or eliminate business cycles. But too much prosperity for too long breeds the conditions that lead not to routine recessions but to crashes. Right. Almost everyone wants freedom. But ‘too much’ freedom for ‘too long’ breeds the conditions that lead not to routine ‘infringements’ but to ‘massacres’. Friday evening Christina Romer gave the Sumerlin Lecture at Johns Hopkins University. The lecture was called “MONETARY POLICY IN THE POST-CRISIS WORLD: LESSONS LEARNED AND STRATEGIES FOR THE FUTURE”. She touches on many bases, some suspect, like when she says “Financial stability is job number one of any central bank. Without that-nothing else matters”. Saying “Nominal stability” would have been closer to the thruth. Given that expectations management is so important, particularly at the zero lower bound, but apparently so hard to use—what is a monetary policymaker to do? For an answer, I think the best place to look is back in history. The most successful attempt to stimulate an economy at the zero lower bound with monetary policy occurred in the United States in the 1930s. People tend to think that Franklin Roosevelt’s most dramatic actions involved fiscal policy and the New Deal. But, his monetary actions were even more dramatic and more important.13 Roosevelt staged a regime shift—by which I mean he had a very dramatic change in policy.14 A month after his inauguration, he took the United States off the gold standard, which had been the basis for our monetary operations since the late 1800s. Then the Treasury, not the Fed, used the revalued gold stock and the gold that flowed in as means to increase the U.S. money supply by about 10 percent per year. This regime shift had a powerful effect on expectations. Figure 5 shows stock prices, which can tell us about expectations of future growth, and a measure of expected inflation. In each panel, I have drawn in a line at March 1933, just before the dramatic change in policy. Stock prices surged instantly, suggesting that expectations of future growth improved dramatically. And price expectations also switched radically. These estimates were derived by James Hamilton, an economist at the University of California, San Diego, who backed out estimates of inflation expectations from commodity futures prices in the early 1930s.15 Hamilton finds that people went from expecting deflation of close to 10 percent a year early in 1933 to expecting inflation of 3 percent just a few months later. This rise in expected inflation implies a dramatic fall in real interest rates, since nominal rates remained at zero the whole time. And the change in expectations and real interest rates had a profound impact on behavior soon after. Firms started to invest and hire again. Consumers started to spend. Figure 7 shows truck sales in the early 1930s. One of the first things that took off following Roosevelt’s regime shift was car and truck sales—as farmers and consumers decided that the future was bright enough that they should take the leap. The bottom line from this episode is that for policymakers to really move the dial on expectations and push them firmly in the direction they want them to go—it takes a regime shift. Smaller, more nuanced moves are easily missed or misinterpreted by people in the economy. Suppose the Federal Reserve wanted to make a bold change in policy today that would really change expectations and strengthen the recovery. What could it do? Back in 2011, a number of economists, including me, argued that the Federal Reserve ought to adopt a new operating procedure for monetary policy: a target for the path of nominal GDP. A nominal GDP target is just a different and more concrete way of specifying the Fed’s dual mandate. The Fed is supposed to care about both inflation and real growth. Nominal GDP, which is the current value of everything we produce, is just the product of both those things—price changes and real growth. Switching to this new target would have some important benefits. In the near term, it would be a regime shift. It would unquestionably shake up expectations. Since we are currently very far below a nominal GDP path based on normal growth and inflation from before the crisis, it would likely raise expectations of growth, and so help spur faster recovery. But one of the best things about a nominal GDP target is that it is also a good policy for the long run. It says that once nominal GDP is back to the pre-crisis path, inflation should be at the Fed’s target of 2 percent and real growth should be at its normal, sustainable level. Now, a nominal GDP target is just one way a central bank could try to improve its expectations management. But my reading of history is that such a bold change is more likely to move expectations in the desired direction than the largely incremental changes the Fed has been trying to use so far. In my talk today, I have tried to point out what I think we have learned about monetary policy from the crisis, and to suggest some ways that policy might evolve in light of those lessons. Let me close with a final, more general lesson for monetary policy from history. That lesson is: Don’t fight the last war. Just as generals sometimes go very wrong by focusing too strongly on not repeating past mistakes, so do monetary policymakers. So, how do we avoid the natural tendency to fight the last war? One way to do better is to learn from all of history, not just the most recent past. Taking the long view is the surest way to prevent short-term mistakes. We also need to embrace evidence-based monetary policymaking. Fed officials and the economists who advise them should always question their views and prescriptions. Central banks, think tanks, and universities should continue to invest in policy-relevant research. And when the evidence clearly points in a new direction, policymakers need to have the nerve to follow it.